This Strive kitchen sink offers professional style with easy-to-clean curved corners. Made of thick, premium quality 16-gauge stainless steel, the double basin features a sound-absorption system that significantly reduces disposal and dishwashing noise. Two deep bowls allow you to soak and clean large cookware and bakeware. This sink includes a divider dishcloth bar, a divider utility shelf for scrubbers and sponges, and a bottom sink rack to help prevent scratches. Includes divider dishcloth bar, divider utility shelf, and sink rack. SilentShield® sound-absorption technology offers quieter performance. Reliable and ravishing, Ancona's Capri series undermount double bowl sink, is guaranteed to turn your kitchen from normal to stunning. This undermount double sink features ample twin 14 inch bowls, perfect for distributing all household cleaning chores. Adjustable to most counters and cabinets, the rear drain provides more valuable space below the sink. Built in stainless steel, its satin finish and delicate curves fusions into any kitchen setup, resulting into a refined harmony to your home. The distinctive, modern design of the Vault dual-mount sink lends a contemporary vibe to your kitchen. This spacious single bowl, handcrafted from stainless steel, is ideal for soaking and washing large pans. 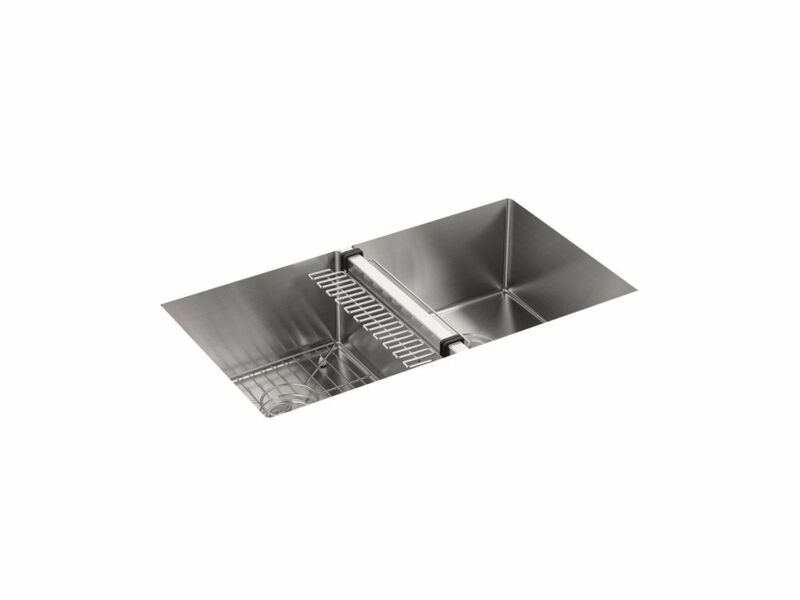 It features tightly angled corners to maximize basin space and a sloped bottom that helps with draining and cleanup. An engineered sound-absorption system significantly reduces disposal and dishwashing noise. Vault's ultra-flat rim makes it easy to wipe from the counter directly into the sink. The distinctive, modern design of the Vault dual-mount sink lends a contemporary vibe to your kitchen. Handcrafted from durable stainless steel, the large/medium bowls allow you to keep clean and dirty dishes separate while offering plenty of room for oversize pots and pans. The sink features tightly angled corners to maximize basin space and a sloped bottom that helps with draining and cleanup. A slightly lowered divide in between the basins helps prevent water from flowing into the countertop. Strive Undermount Stainless Steel 32 Inch 0-Hole Double Bowl Kitchen Sink This Strive kitchen sink offers professional style with easy-to-clean curved corners. Made of thick, premium quality 16-gauge stainless steel, the double basin features a sound-absorption system that significantly reduces disposal and dishwashing noise. Two deep bowls allow you to soak and clean large cookware and bakeware. This sink includes a divider dishcloth bar, a divider utility shelf for scrubbers and sponges, and a bottom sink rack to help prevent scratches. Strive Undermount Stainless Steel 32 Inch 0-Hole Double Bowl Kitchen Sink is rated 5.0 out of 5 by 8.